Patients with a sprained foot often experience a sudden onset of pain during the causative activity. However, patients may also experience pain and stiffness after the provocative activity, particularly the next morning. Symptoms may be felt on the top, bottom or sides of the affected joint. Occasionally pain may be referred into the toes or ankle on the affected side. 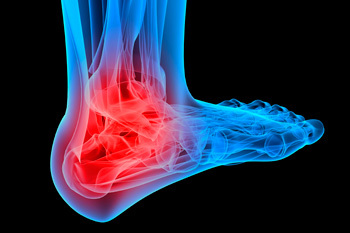 A sprained foot is a condition characterized by damage or tearing of the connective tissue (such as ligaments, cartilage and joint capsule) of one or more joints of the foot. The rear foot comprises of 7 bones collectively known as the tarsals. The mid foot comprises of 5 long bones known as the metatarsals. The toes each comprise of several small bones known as the phalanges. Each bone within the foot attaches to the adjacent bones forming joints. Each of these joints comprises of strong connective tissue wrapping around the bony ends and cartilage which lies between the joint surfaces, cushioning the impact of one bone on another during activity. Chilblains are itchy and/or tender red or purple bumps that occur as a reaction to cold. The condition is also known as pernio or perniosis, and is a localised form of vasculitis. Children and the elderly are most often affected. In children recurrences each winter for a few years are common but complete recovery is usual. Chilblains in elderly people have a tendency to get worse every year unless precipitating factors are avoided. Severe cold injury can damage the small bones in the digits, leading to microgeodic disease, swelling and sometimes, bone fracture. Capillaritis is the name given to a harmless skin condition in which there are reddish-brown patches caused by leaky capillaries. The capillaries are small blood vessels near to the skin surface. For unknown reasons they sometimes become inflamed, although a true vasculitis is not seen on skin biopsy. Blood cells may pass through small gaps that arise between the cells, which make up the capillary walls. The result is tiny red dots appear on the skin, described as cayenne pepper spots. They group together to form a flat red patch, which becomes brown and then slowly fades away over weeks to months. The cleft between the fourth and fifth toes is the most frequently affected, with moist soft skin that peels off easily. Often the skin splits uncomfortably (a fissure). It may smell unpleasant. It is generally mild; very inflamed athlete's foot is generally due to secondary bacterial infection. Athlete's foot can be due to one factor or a combination of factors. Bacterial infection (erythrasma, pseudomonas, Staphylococci and Streptococci). Soft corn (build-up of thick skin because the toes are pressing against each other). Injury e.g. over-vigorous removal of peeling skin. Skin conditions such as psoriasis, eczema or keratolysis exfoliativa. What is the Treatment for Cracked Heels? Cracked heels or heel fissures are a common foot problem experienced by many people. In most cases the problem is merely a nuisance and unattractive to look at, however when the cracks or fissures become deep, standing, walking or any pressure placed on the heel can be painful. What Kinds of Ankle Injuries Are There? Do You Know How to Care for a Sprained Ankle? Why I Have Corns on Feet? What are Ingrown Toenails and What Causes It?